Originally released as a limited run via iTunes in 2008 to commemorate the 20th anniversary of his passing, The Last Concert is now available on CD for the first time. 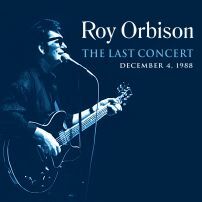 Recorded on December 4, 1988 in Cincinnati, just two days before his sudden death, this was the last time Roy ever performed. This collection of fourteen songs, including seven top ten singles, is the exact order of his show that evening.